Your hashtag list should be updated regularly, in most cases monthly is fine. Finding the best hashtags for your business can be time consuming but is well worth doing if it means you gain relevant followers, organically. When putting together clients hashtags lists I always start with their competitors. This means finding similar accounts that have a substantial following and looking at what hashtags they are using. If they're relevant to the brand and have a lot of posts under them, note them down. I then search key words surrounding the brand and see if they are popular hashtags. Sometimes this means they have a lot of posts under them, other times it just means the posts that are there are really relevant and likely to attract the right customer base. Finally I will add some generic hashtags to this list such as 'weekend', 'summer' etc. These wont necessarily reach the most relevant accounts but they will increase your follower count. Each list I create will contain 30+ hashtags so that when I post on Instagram I don't have to think of the hashtags on the spot and therefore miss out on the popular ones. 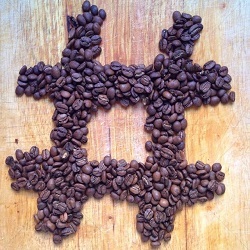 Changing up the hashtags each time will ensure you reach a wider audience and will increase your followers quicker.